These are the bills affecting animals that were introduced in the 2017/18 session. The ones at the bottom passed – all others died on Dec. 31, 2018. SB 54: “Puppy Lemon Law”– provides for dog purchaser protection. This bill gives people who purchase sick puppies more time to discover, treat and report their puppy’s condition to the seller to demand a refund or replacement and grants greater consumer protection to people whose families purchase sick or dying puppies so that sellers can be held responsible. Introduced by Sen. Stewart Greenleaf + 7 co-sponsors (Co-Sponsorship Memo). Status: Passed CONSUMER PROTECTION AND PROFESSIONAL LICENSURE Committee: Contact your state senator to ask them to support. SB 69: “Cordelia’s Law” – (Fact Sheet) adds protection for horses, additional protections for cruelty to service dogs and provides for development of guidelines for humane society police officer advisory board. Introduced by Senator John Eichelberger + 11 co-sponsors. (Co-sponsorship Memo). Status: Rolled into HB 1238 signed into law as Act 10. SB 248: A Ban on Traveling Animal Exhibitions. Introduced by Senator Daylin Leach. (Co-Sponsorship Memo). Status: Referred to JUDICIARY Committee. SB 176: Child and Animal Abuse Cross Reporting – this bill will provide for more cross reporting of suspected cruelty to animals and suspected child abuse. Introduced by Senator Guy Reschenthaler + 15 co-sponsors (Co-sponsorship memo) Referred to JUDICIARY. SB 230: Animal Cruelty Penalty Increase for Cats and Dogs. Introduced by Sen. Lisa Boscola +12 co-sponsors (Co-Sponsorship Memo). Status: Referred to JUDICIARY. SB 298: Senator Alloway’s Libre’s Law: increases the penalties for the most heinous of animal abuse. Senator Alloway + 27 co-sponsors. (Co-Sponsorship Memo) Status: Status: Rolled into HB 1238 signed into law as Act 10. SB 480: Pet Cruelty in Domestic Violence Situations. Introduced by Senator Andy Dinniman + 10 co-sponsors. (Co-Sponsorship Memo) Status: Passed JUDICIARY. SB 636: The Motor Vehicle Extreme Heat Protection Act. Introduced by Senator Andy Dinniman + 12 co-sponsors. (Co-Sponsorship Memo). Status: Passed JUDICIARY. SB 779: Updating the definition of a “service animal” to apply to more animals. Introduced by Senator Tomlinson. (Co-Sponsorship Memo). Status: Referred to JUDICIARY. This bill has been amended into HB 1216. SR 35: Animal abuse prevention task force. Introduced by Senators John Rafferty and Richard Alloway (Co-Sponsorship Memo). Status: Referred to JUDICIARY. HB 13: This bill requires that after an animal abuser is convicted, the victims of that abuse will be forfeited to an animal shelter, furthers horse protection, creates an offense of aggravated cruelty to animals, addresses tethering/inclement weather. Introduced by Rep. Ryan Bizzarro. (Co-Sponsorship Memo). Status: Status: Rolled into HB 1238 signed into law as Act 10. HB 268: Veterinarian Immunity Bill – provides civil liability to Veterinarians, Veterinarian technicians, and Veterinary assistants when they report suspected animal cruelty in good faith. Introduced by Representative Mark Keller + 36 co-sponsors. (Co-sponsorship Memo) Status: Status: Rolled into HB 1238 signed into law as Act 10. HB 274: Allowing judges to include pets in Protection from Abuse orders. Introduced by Rep. Marsico. (Co-Sponsorship Memo). Status: Referred to JUDICIARY. 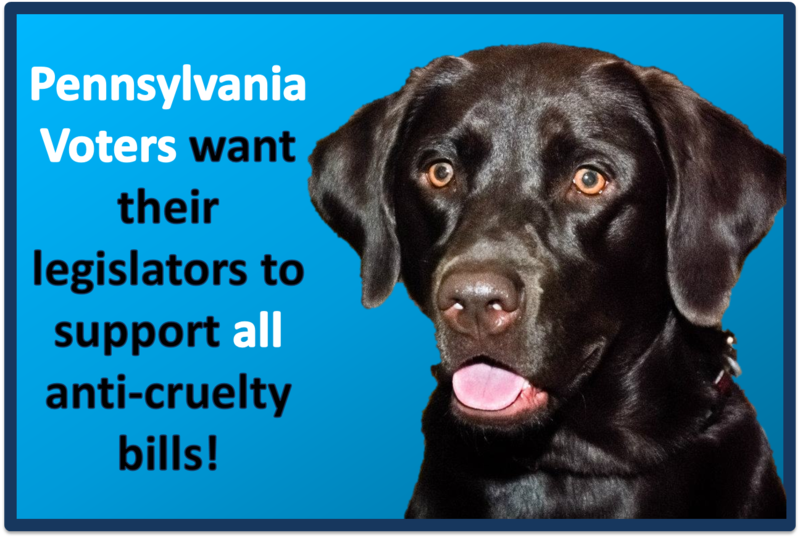 HB 308: “Angel’s Law“ increased penalties for violations of the animal cruelty laws in Pennsylvania. Introduced by Rep. Dom Costa +27 co-sponsors (Co-Sponsorship Memo). HB 323: Prohibits tethering a dog outside between 10 p.m. and 6 a.m., in extreme weather; and limits the type of tether which may be used. Introduced by Representative Ed Neilson + 14 co-sponsors. (Co-Sponsorship Memo) Status: Referred to House Judiciary Committee. HB 493: An Act designating the “shelter pet” as the official pet of the Commonwealth of Pennsylvania. Introduced by Rep. Schlossberg. (Co-Sponsorship Memo) Status: Referred to STATE GOVERNMENT. HB 853: Legislation increasing penalties associated with animal cruelty offenses. Introduced by Rep. Greiner. (Co-Sponsorship Memo) Status: Referred to JUDICIARY. HB 1197: Adding animal fighting to the list of offenses that are enforceable under the state’s racketeering provisions. Introduced by Rep. Dom Costa (Co-Sponsorship Memo). Status: Passed full house unanimously. HB 1216: Allowing law enforcement to remove dogs and cats from hot cars. Introduced by Rep. Farry and Rep. Costa. (Co-Sponsorship Memo). Status: Passed House and second consideration in the Senate. Awaiting final passage. HB 1917: clarifies requirements for Humane Society Police Officers. Introduced by Rep. Ryan (Co-Sponsorship Memo). Status: Amended to improve the original bill language in the AGRICULTURE AND RURAL AFFAIRS . Passed first consideration – laid on the table. HB 2164 – allowing for research animals to be adopted. Introduced by Rep. Readshaw (Co-sponsorship Memo) Status: Referred to AGRICULTURE AND RURAL AFFAIRS. HB 2601 – Prohibiting the sale of dogs, cats and rabbits in pet stores unless sourced from shelters and rescues and require advertisers to include license numbers. Introduced by Rep. Jason Ortitay + 54 cosponsors. (Co-Sponsorship Memo) Referred to AGRICULTURE AND RURAL AFFAIRS. HB 1238: Comprehensive Animal Cruelty Bill (Libre’s Law), tethering, immunity for veterinarians and humane society police officers and more. (Fact sheet). Introduced by Rep. Todd Stephens + 37 co-sponsors. 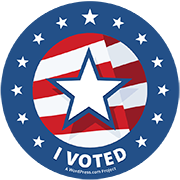 Status: Passed into law – now Act 10! HR 9: a Resolution recognizing February 2017 as “National Spay and Neuter Awareness Month” and February 28, as “World Spay Day” in Pennsylvania. Passed. HR 54: Resolution Designating February 24, 2015, as “Spay Day” in Pennsylvania – introduced by Representative Mike Schlossberg (Co-Sponsorship Memo). Passed. HR 242: A Resolution recognizing April 29, 2017, as “World Veterinary Day” in Pennsylvania. Introduced by Rep. Zimmerman. Passed. For information on the outcome of bills affecting animals in the 2015/16 session check: Bills from 2015/16 in our Archive section.